Washington Park was created in the 1800s covering Madison and Washington Avenues. Before its creation, the 90-acre area was used for private estates, cemeteries, and parade grounds. The influencers for the design of the park Frederick Olmstead and Calvert Vaux modeled it similar to one of the largest parks in New York City, Central Park. Visually, Washington Park has a unique features including a lake house, the Moses Fountain, and over five monuments. Being that the park has contributed to the continuance of culture and recreation, it was added to the National Register of Historic Places in 1972. Today, Washington Park serves as a home for concerts and annual walks. Live at 5 are a series of concerts held in the park on Thursdays during the summer. The African-American Family Day Arts Festival occurs every August. Its more distinguished event, the Tulip Festival, happens in multiple cities to celebrate the peak of blossoming flowers and the beginning of spring. 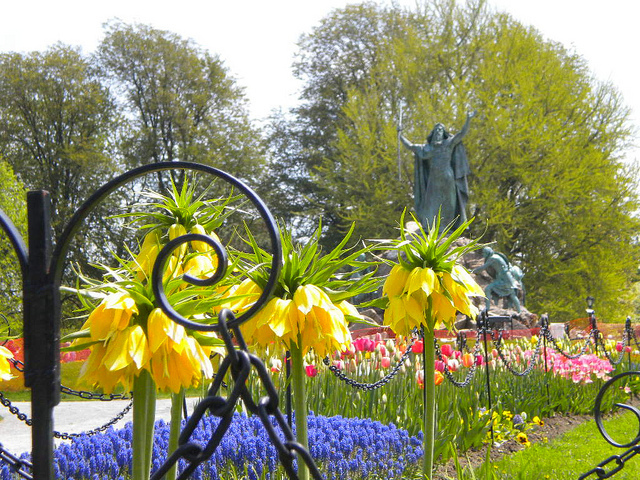 Albany’s Tulip Festivals celebrate the heavy Dutch heritage within the city and showcases the city’s culture with a Tulip Queen and strategic placement of Albany’s flower throughout the park. With a variety of events held, Washington Park engages the community and caters to a broad range of visitors. Camille Gordon, “Washington Park,” Albany Walks for Health, accessed April 20, 2019, http://www.albanywalksforhealth.com/items/show/116. "Park History: 1800-1986 - Washington Park Conservancy." Washington Park Conservancy. Accessed March 25, 2016.